Did you know that Koh Lanta is the second largest island in Thailand (after Phuket)? Yes, it’s larger than more famous places like Koh Chang or even Koh Samui, yet still not nearly as much visited. But okay, there is a reason for that: The beaches are rather average and there aren’t huge waterfalls like on Koh Samui or elephants like on Koh Chang that can more easily be promoted by the Tourism Authority of Thailand (TAT). But that doesn’t mean that it’s not worth it to travel to Koh Lanta for a few days. I went there recently for four nights and had a great time hanging out at the scenic beach bars and driving up and down the coastal roads by rental motorbike. Plus, I did a day trip on the speedboat to Koh Rok which had one of the most beautiful beaches I have ever seen in Thailand with pure white sand and crystal clear water. And all that with only a fraction of tourists compared to other hot spots in this country. 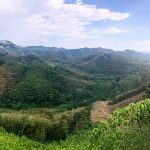 So I would definitely recommend you to check out Koh Lanta for a few days, and maybe even combine it with onward travel to Ao Nang and/or Phuket. I have already written extensive guides on the Lanta Daylife and Lanta Nightlife and so in this final part of the little series I’m going to cover the different ways on how to actually get there from Bangkok and Krabi. 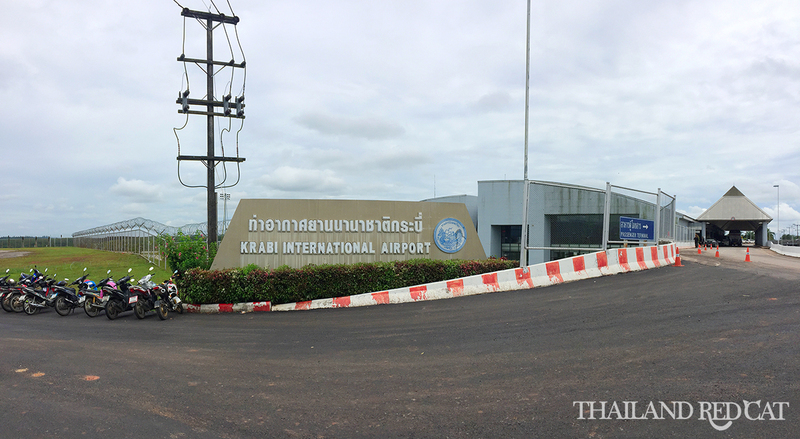 There is no airport in Koh Lanta so if you come from Bangkok (or anywhere else) you will need to travel through Krabi Town. So here is the current information to both legs of the trip – Bangkok to Krabi and Krabi to Koh Lanta. Domestic flights in Thailand have never been so cheap and you can easily get a one way ticket with AirAsia or NokAir for around 1,200 Baht, and they even regularly have promo fares (especially AirAsia) for as low as 690 Baht. That’s cheaper than taking a bus. This is obviously also the quickest way to get from BKK to Krabi in just about 85 minutes. Once you have arrived there you can take a minivan directly to Koh Lanta. It costs around 500 Baht (they change the prices quite regularly as do the companies serving this route). Just walk out of the arrival hall (see the right side of the picture above) and ask for “minivan to Koh Lanta”. The trip takes about 1.5 hours and they will drop you at your hotel. I’m more and more reluctant to even include the busses as a serious option for long distance travels in Thailand. Why? 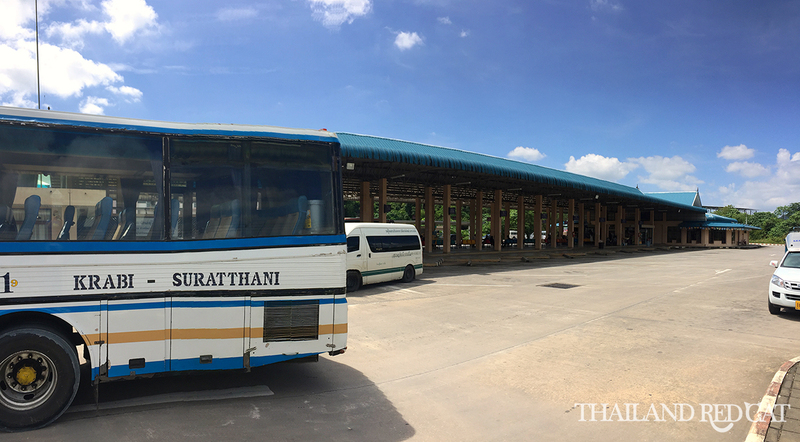 Well see, the bus from Bangkok’s Southern Bus Terminal to Krabi takes about 12 hours and costs around 650-1,200 Baht, depending on the type of coach. In contrast, a flight takes less than one hour and a half and costs 1,000 Baht on average. What you think is better value for the money? If you want you can book a bus ticket online, but it’s not really necessary. You can basically just go to the Southern Bus Terminal in Bangkok (a metered taxi will take you there from downtown for 200-250 Baht) and just buy a ticket as you get there. They have at least hourly departures from early in the morning till late in the evening and overnight coaches, too, if you want to save money on accommodation. The advantage when booking your bus ticket online is that you can choose a seat in advance so you have good chances for the front row. 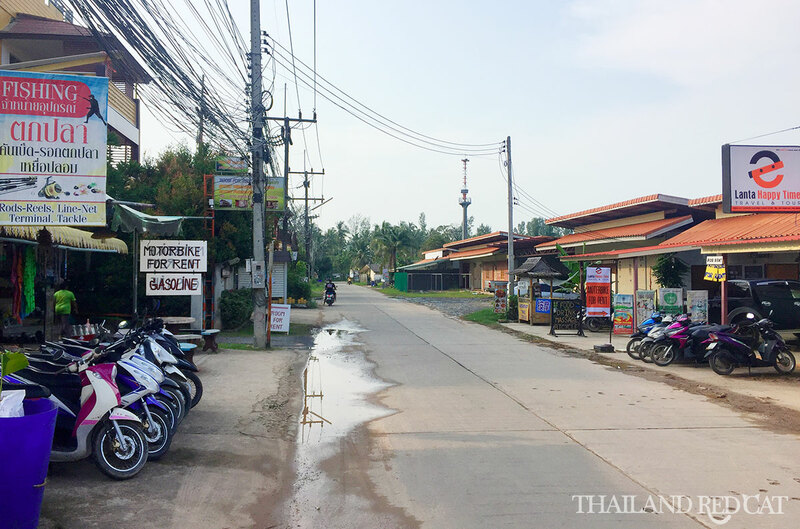 There is no railway station in Krabi Town. 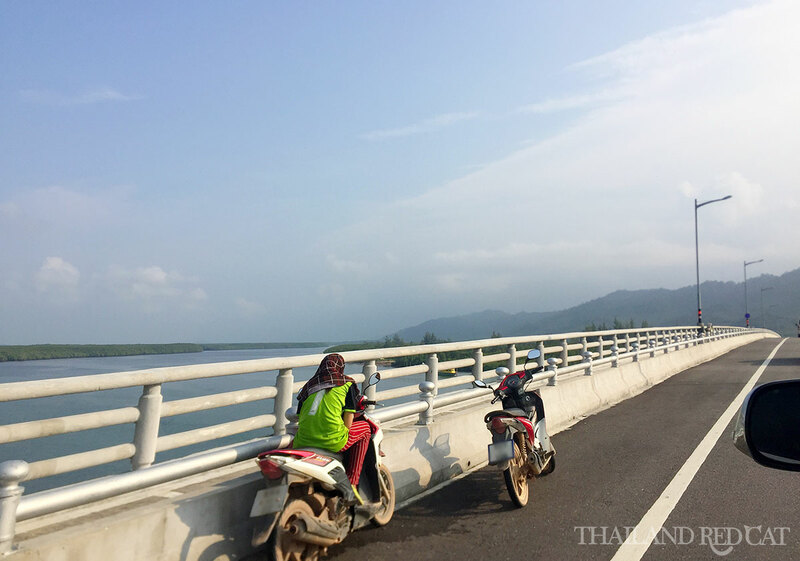 The closest you can get is Trang and from there you can take a minivan directly to Koh Lanta for 250 Baht. This is actually how I traveled there last month – I came from Hat Yai by minivan and changed to another minivan at the Trang Bus Terminal. So if you like train travel that might be an option. The ticket costs about 1,280 Baht for 1st class and the trip takes 15-16 hours (overnight). You can check the current prices depending on the class on the Railway of Thailand’s website. From Krabi you can take a minivan directly to Koh Lanta. As already mentioned earlier, the services at the airport are a little bit expensive (around 500 Baht), but if you take them from the Krabi Bus Terminal or somewhere in downtown the price will be around 300-350 Baht (quite strange as the distance is actually a little bit longer). The price includes the whole trip – drive to the pier, ferry ride & drop off at your hotel on Koh Lanta. 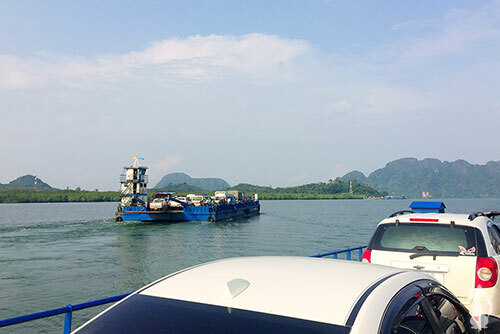 It takes about 90 minutes to reach the car ferry terminal of Krabi. There are regular services (about every 20-30 minutes) so you never have to wait long. The boat trip to Koh Lanta itself only takes 10-15 minutes. Like already mentioned, they will drop you right at your hotel. Just tell the driver your hotel name (he will usually ask you). If you want to save some money on the motorbike rental I would recommend you to get off on the village near the pier where rental prices are cheaper than in the beach towns. Which brings me to the final point of this guide. I highly recommend you to rent a motorcycle (or “motorbike” how the Thais say). It’s the best way to get around in Koh Lanta and you will need transport to explore this island, anyway. It’s not nearly as dangerous to drive there compared to Koh Samui or Phuket (less vehicles on the road) but still be careful as there are plenty of (mostly inexperienced) foreigners driving from beach to beach. If you rent at the village near the ferry pier the prices tend to be a little bit cheaper than on Long Beach. Rates are around 150-200 Baht per 24 hours and on Long Beach (or elsewhere really) you would pay around 250-300 Baht per 24 hours. And that’s everything there is to know on how to get from Bangkok or Krabi to Koh Lanta. If you want to travel back to Krabi then you can book the minivan either directly at your hotel or at one of the many travel agents (the going price is 350-400 Baht). Enjoy! Note: There is currently no national park entrance fee in Koh Lanta. 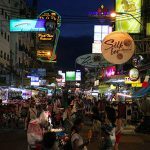 Is Khaosan Road Worth All The Hype?